The world is not broke; there is no global recession. The markets have not crashed. We don’t need a stimulus package. We don’t need to close down factories and adopt cost cutting as a new mantra. 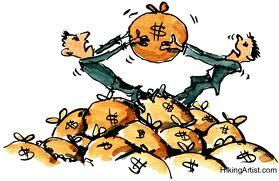 The world is awash in wealth and cash but bankers and big business control it , making sure they get the biggest cut. You and your families may suffer but they won’t. In a global recession caused by blue chip megalomania the people at the top won’t miss out on their holidays, villas, gym memberships and four wheel drives. They “work” for six figure salaries whilst the rest of us feel thankful that we have five, measly figures that barely cover basic expenditure like food and shelter. These 500 people have pumped fear into the economy so that the “lucky ones” amongst who have jobs that our employers tell us are disposable. We have been made to feel weak and useless by public sector officials on enormous salaries who tell us that hospitals, the police force, libraries and schools are now businesses that have to maintain profit margins but there’s no profit sharing… except for…yes…you’ve guessed it….those at the top! If you can’t justify why you’re important then they’ll ship you out! Don't think we can afford that shampoo! "I'm smug, I'm solvent - isn't everyone?" No one has yet enlightened them to the fact that some of the richest and most innovative men and women on this planet dropped out of university. The late Steve Jobs’ advice to the 2005 graduates of Stanford was: “stay hungry, don’t settle”. He’s right and, in this economy, there’s no chance of that since home ownership is a distant dream and food prices ever-increasing. Mr Jobs was a visionary as he predicted the fate of generations to come. However, the outlook is not all bleak….at least there’s a variety of gadgetry to keep idle minds – whilst they’re looking for suitable employment - busy…the ipod and the ipad will keep you awake for hours. Mindlessness is now meaningful industry. A smile don't cost a thing! But the world is not broke – that’s a lie – false economic structures underpin values that keep the poor poorer and the rich richer. The truth is that there’s lots and lots of money to go around. But its only circulating around the landscaped gardens of the second homes that most politicians and chief executives in charge of the public sector own. “Work for no pay” – yay! – wonder which hot shot PR consultant came up with that slogan! A political fabrication that is bandied around is that of social mobility – the ability to move up a rung on the social ladder. Move up to where……..from hard up to just getting by and hoping that my student debt will be written off in my 50’s. Social mobility means that you’ll wish half your life away before you realize that you could have been taking some practical measures like opting out of the rat race. Adult education is one of them but the exhaustion you’ll endure from overseeing the education of your own children – getting them from Average to averagely A* will have you in a psychiatric institution before you get your pension. Politics is a form of mental illness and politicians an insane bunch – they’ve created a poison pill. Start cutting back, pay more taxes, price hikes on food but we won’t be joining in – cost cutting is only for the working class. This is one big charade that is fed to the people through the media. The world is not broke or broken though the people in power are trying to break it – make no mistake about that. The world is rich with hope, ambition and dedicated activists who do not have university education. All they did was sit and think…..in a different way…..and not become obedient university fee paying clones. Politicians want you to go to university in the hope that you’ll become higher tax bracket fee payers. They want you to conform and be grateful to have any job – even one where you’re mercilessly exploited. They’ll sow the problems and you’ll break your back reaping an abundant harvest of red tape. The aim of bureaucracy is dehumanization and….it’s working. At no other time in the history of the world has compassion and common sense been so scarce. The world is not broke but neither is it whole. The only thing that’s broke is the minds and hearts of our leaders and where there’s no sense, there’s no feeling. Our pain is not their pain; our needs are not their needs so our experiences of making ends meet don’t resonate with them. In fact, we’ve got nothing in common! So what can we do to fix the problems? I guess we can share good energies, healthy thoughts and fruitful labour amongst ourselves. We can turn 2 loaves and 5 fish into tuna melts for the world – if we have to. Those people at the top may be laughing all the way to the bank but when assets get frozen…..who laughs last laughs the longest. Good old-fashioned mirth is always in vogue since we don’t take ourselves too seriously – well, not as seriously as politicians, CEO’s and Fund Managers. Deep down we know that we’ve got one over them…..people in high places live in fear…fear of losing their luxurious lifestyles. Trading in their yachts, rolexes, convertibles, martinis by the pool will break them down. Pig farming would have been alot cleaner than politics! Not having anything so complex to juggle – just our taxes, mortgage, bills and regular grocery shopping we know we’ll get by. We can count blessings whilst they count their miseries. The rich have never been good at generosity so it may be that we’ll have a better chance of squeezing through the eye of a needle – after a few gym sessions! We can go without because we feel comfortable within – happy that we’ve not succumbed to the greed that infests the corridors of power. We’ll make it through the gates of heaven ‘cos we’re travelling light. 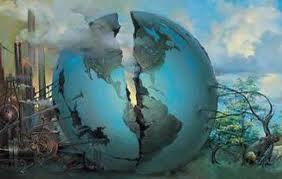 The world is not broke, you are not insolvent or morally bankrupt. We’ll sleep peacefully in our beds at night after counting a few sheep whilst the people-at-the-top- count a few more grey hairs, lines on their forehead and stains on their souls. They have robbed the poor to feed the rich. The world is not broke, my friends, false economics make you believe that it is. Those good people on CNN will tell you that it’s wrecked with war and famine. Humans are not kind, least of all those people at the top. So do not buy in to the hype; the world can be rescued but we must fix it first – from the inside. The world is not broke and neither are you!